I first tried on the Ballad Midi Dress in Merry (size XS) around a week ago, and didn't post it because I had an Alice in Wonderland moment. Wasn't I too short for the Ballad Dress, which was maxi length even on models? But it was maxi length on tiny 4'11" me. Something was up. See the full article for more photos and the full review! Turns out I was correct that this dress is actually a Barney's XO, in a length that hasn't been seen anywhere else — the Ballad dress as designed for short gals, or a Ballad midi on everyone else. I love that it can be worn lab coat style, with all of the buttons open. Here it is over the Atwood Midi in Carnival, another tempting Barneys XO. Sizing: TTS to maybe a bit smaller than usual Ace sizing. I'm wearing an XS here, and I am usually an XS in Ace & Jig. The waist is elasticated in back and fit pretty well on me. 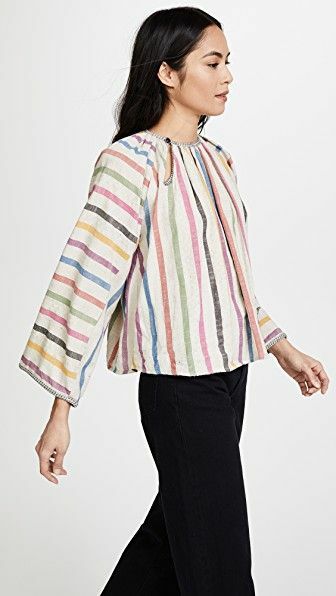 Top: The sleeves were just a smidge too boxy and long, and the collar a tad too high, both issues that were exacerbated by the crispness of this textile. It was very reminiscent of the Bronte dresses in terms of cut on top, and those posed similar issues for me. Body: Great length (midi on tall people, maxi length on shorter gals), which will likely be more practical than the maxi length for most. Super flattering high waistline. The length was just about ideal on me, and had me reconsidering whether I needed one of the regular-length Ballad dresses, minus a few bottom inches. The bottom is a lovely A-line shape that elegantly skims the body. Pockets: No, I don't think so, which somewhat limits its use as a topper/light coat. Layering Potential: Yes! If you like the coat/duster look, you should definitely go for it, as it would be a two-for-one in that case. Though I will say that it ends up looks a bit lab-coat in this white textile. Textile: Merry is slightly sheer, but not noticeably so. The main textile has a rather crisp hand, and I imagine it would hold up well over time. The lacy bits include tiny holes, but nothing large enough to peep through. I feel like this might not be the best choice of textile for this particular cut, as Merry doesn't so much drape as it does kind of... slightly protrude. As mentioned, it's quite crisp. Might get better with some wear. Overall: I didn't go home with it. I didn't love it as a duster/coat, and I'm still waiting on my perfect Teasdale Dress in Merry and don't feel the need for two pieces in this textile. So it was ultimately a pass. The fit seems TTS, and more so than the Paz tops, which seemed to run small, and the body shape was fairly similar to the Rosemary Dresses of years past, with a slightly dropped waist, pleated skirt, pockets (!! ), and normal sleeve construction. It's in the vein of minidress shapes that I find myself gravitating towards time after time, but in this thicker textile, it was sadly a pass for me, especially as warmer weather approaches. I do have it coming in Emerald and Twine though, so we shall see if a Paz Dress ends up in my closet! You can shop both of these items over at Barneys, with free shipping & returns! The Paz Dress is also available at Shopbop, if you prefer. Don't forget to check out Part 1 of this article, if you haven't read it already, and definitely take a look at the rest of my try-on articles if you liked this one. I noticed something similar with the cobalt canyon dress. It's not just barneys xo meadow dress - it's actually like 5-6 inches longer than the regular ones. It's nice to have different lengths for all us different folks.